Ronald Reagan UCLA Medical Center was initially awarded Magnet Status for Nursing Excellence from the American Nurses Credentialing Center (ANCC) in 2005 and has since been re-designated in 2010 and 2015. This repeated recognition of nursing excellence communicates our commitment to providing evidence-based, innovative, and compassionate care to patients, families, and our community. 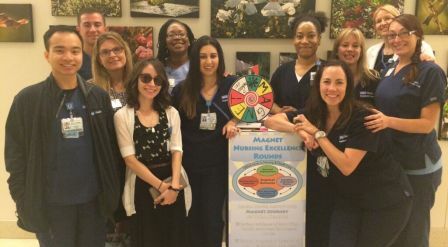 Ronald Reagan continues on the Magnet journey, recognizing that excellence occurs from continual monitoring and evaluation of practice, which in turn allows for identification of opportunities for growth and change. We are proud of our past successes and are committed to continuing our tradition of excellence into the next re-designation and beyond!